More accurate words have never been written. Gandhi wrote some powerful stuff, and well some crazy stuff, and some stuff that you definitely couldn’t say today. (check his company out at www.Terrostar.com ) The first thing that I note is that Target has a bunch of different toy groupings at buy 1, get 1 50% off. 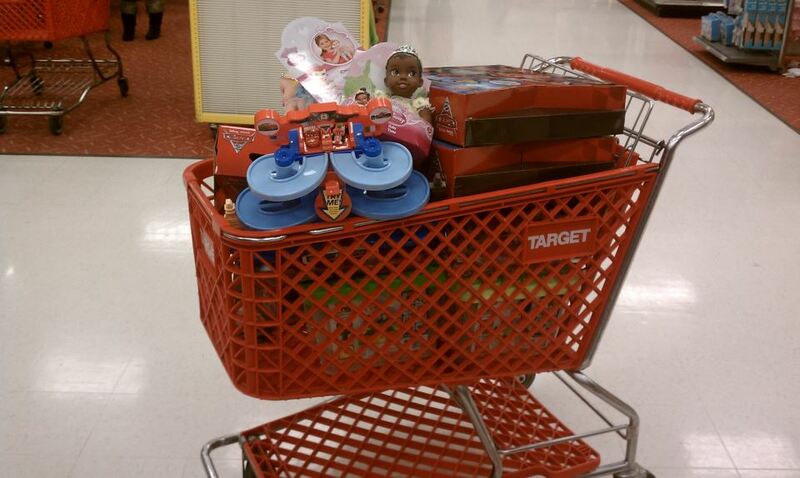 All said and done I ended up with a cart load of toys and turned Tom’s 250 bucks into 364 dollars worth of toys. You can see the full monty on our facebook page, I like to take pictures of everything I buy for people so they can see the good they really did. Shopping vicariously if you will. Cutscene – Running home with a truck full of toys to eat dinner at 5 o’clock, the toy drive is over at 6:30 and I’ve got a couple more toys I picked up at home anyway. Well fed, and underway, I make my way over to the district to meet up with GySgt Matt Dorsey, and the rest of our local toy gathering heroes. Upon arrival I note that 1 they picked up some toys, which is good, because things were looking pretty dire. And that there is a news crew outside, not just filming the event, but interviewing people. OH NO. To say that I’m camera shy, is an understatement, and I’m fully aware that I look like a homeless person at that point, a penniless philanthropist if you will. Anyway I help Matt and crew unload all of the toys and they of course let me know that they’d like to put me on the news…. OH LORD. It didn’t go as bad as I’d imagined, They were kind enough to edit out a lot of my babble. Too bad they couldn’t edit out my beard. You can read the full article here – http://www.whbf.com/story/16205093/toys-for-tots-gets-check-for-12500#.Tt9T6gw_72k.facebook pretty awesome night for kids in the Quad Cities.